Oct 17, 2008 – On October 19, 1977, the apartheid regime declared illegal 19 Black Consciousness organisations, banned two newspapers and detained scores of activists. That day is now commemorated in South Africa as “Black Wednesday” and is also marked as National Press Freedom Day. The Nelson Mandela Foundation asked political commentator Xolela Mangcu to mark the 31st anniversary of Black Wednesday by analysing an essay on Black Consciousness written by Nelson Mandela on Robben Island in 1978. Entitled Clear the Obstacles and Confront the Enemy: Whither the Black Consciousness Movement? An Assessment (Download, 6mb) it was published in 2001, by Zebra Press in a book called Reflections in Prison. Edited by Mac Maharaj, who proposed the idea while also serving a sentence on the Island, and who smuggled the essays off the island, the book contains essays written in secret while the authors were incarcerated on Robben Island. The other essays are by Walter Sisulu, Govan Mbeki, Ahmed Kathrada, Toivo ya Toivo, John Pokela, Eddie Daniels and Billy Nair. Their essays were written in 1976 while Mr Mandela’s was written two years later, in 1978. We would like to thank Struik for allowing the Foundation to use this piece. It is thirty-one years since the banning of the Black Consciousness movement and the brutal murder of its leader, Steve Biko, by the apartheid police. In his 1978 essay on the Black Consciousness Movement (BCM), Nelson Mandela describes the movement’s demise as follows: “they fell fighting, even though without arms, and have joined that long line of South African martyrs whose heroic deeds span the five hundred years of our freedom struggle.” This is an expression of Mandela’s generosity – the kind of generosity that enabled him to shepherd South Africa across the chasm from apartheid to democracy. But Mandela’s generosity is not offered without an equal dose of criticism of the movement. Mandela’s critique was part of a broader response by the resurgent African National Congress after it had been banned in the 1960’s and after operating largely underground throughout the sixties and the seventies. By the eighties the ANC was ready to reclaim what it regarded as its rightful place in the leadership of the liberation movement. There are of course a number of factors contributing to the BCM faltering, including the failure of the post-1977 movement to offer an inspiring vision, and failure to rise above internal leadership squabbles. For example, the BCM made the strategic mistake of abandoning its cultural politics for a politics of socialism that increasingly became abstract and divisive, leading to the emergence of various splinter groups. But the movement’s demise also had something to do with the appeal of the ANC’s philosophy of non-racialism and multiracialism – rooted in the arguments that Mandela makes in his essay. These arguments became part of the ANC’s above-ground organizing through formations such as the United Democratic Front in the 1980’s. The UDF was a multi-racial, multi-class broad church which brought together forces opposed to apartheid under one umbrella. It is not insignificant that in his praise of the BCM Mandela mentions that it is part of a five hundred year history of struggle. Throughout the essay Mandela seems peeved by the idea that the movement claims somehow to have been the first at everything. For example, he rejects the assertion that the movement was the first to offer an inclusive definition of blackness by pointing to the African People’s Organization’s record in this regard. Nonetheless, he displays an in-depth grasp of not only the rise of the movement but also of the exact details of its operations and programmes. This would suggest the paper was authored after extensive consultation with former BCM activists on the island. This was not a mere personal reflection on his part but part of the ANC’s collective, ideological offensive. Even though Mandela presents his essay as “unprejudiced and objective analysis of an emergent youth movement” there is no question that it is part of the ANC’s collective ideological offensive. It is to be remembered that after the arrival of the Black Consciousness militants Robben Island became the hotbed of ideological contestation. Nonetheless the essay is balanced – as opposed to objective – to the extent that Mandela credits the movement with reviving political activity in the country and thereby filling in the gap left by the banning of older liberation movements. Even though people such as Raymond Suttner have questioned the idea of a political lull in the 1960’s, there can be no question that the BCM distinguished itself by legitimizing in the eyes of black people the idea of above-ground political organizing. Mandela thus outlines why the movement under the leadership of Steve Biko and the South African Student Organization (SASO) felt it necessary to wrest control of the struggle from the majority white National Union of South African Students (NUSAS). The BCM’s ideology resonates with his pride in the culture of his people. This is not unsurprising given that for all his modernist sophistication Mandela still has attachments to where he comes from and the values and ways of his people in the rural villages of the Transkei. In the second part of the essay Mandela’s grudging admiration gives way to a full frontal assault on BCM on a number of fronts. First, he argues that the movement’s backward clannishness: “in a cosmopolitan environment where common sense and experience demand that freedom fighters be guided by progressive ideas and not by mere colour, the ideology of the BCM remains embryonic and clannish (p39).” But this argument reveals the limitations of Mandela’s own political outlook. In essence Mandela is a child of the Enlightenment and in that sense is also a contradictory figure torn between his cultural nationalism for which he admires BCM and the political modernism required of a cosmopolitan movement. Political modernism stems from the Enlightenment idea of progress as the triumph of reason – what he calls common sense – over emotion, objective over subjective analysis, and scientific rationality over superstition, the universal over the particular, and therefore integrationism over segregationist thinking. Gary Peller captures this dualistic or symmetric view of the world and how it in turn informed the integrationist or non-racialist framework in much of early twentieth century political thinking as follows: “integrationist beliefs are organized around the familiar enlightenment story of progress as consisting of the movement from mere belief and superstition to knowledge and reason, from the particular and therefore parochial to the universal and therefore enlightened (Peller 1994:74).” This is the kind of rationalism that has informed liberal and Marxist critiques of Black Consciousness alike. Belief or recognition of race and the concomitant self-separation along racial lines is irrational and constitutes what Marxists would call “false consciousness”. Witness for example Mandela’s relief on being told that existentialism is not the basis of Black Consciousness: “ it is reassuring that the philosophy of existentialism is not part of this movement’s outlook since it is a philosophy of superstition, individualism and chaos, which can never be used as a basis for solving important social problems (p42)”. Interestingly Mandela is writing at exactly the same time that people all over the world are rejecting this narrow modernist understanding of human aspirations to embrace post-modernist identities by openly acknowledging not just class but also racial and gender identities. The search for identity is sometimes found through traditional rites and practices that if viewed through the enlightenment lens would be dismissed as pure sentiment and superstition. Mandela’s rational modernism also leads him to evaluate the movement on the basis of its organizational strategies and planning capacity. He credits the movement for having “a shrewd plan, a powerful ideology and an able youth leadership (p26).” But as Sam Nolutshungu points out in his analysis of the BCM: “Movement – emphasising sentiment and spontaneity and a diversity of ideological outlook – comes nearer to an apt description of both the popular mood and of the place of the organization with relation to it (Nolutshungu, 1982: 149).” The movement may indeed have been small in numbers, and may indeed have had the shrewdness that Mandela credits it with, but far more important is how it tapped into latent youth sentiment at the right time. It is not a mere coincidence that the movement emerged at the time that it did – a period of student and youth uprisings all around the world. The year 1968 is the world-historical moment in which youth and students rebelled in major cities such as Chicago, Madrid, Mexico City and Tokyo. Was the BCM an American front? The most unwarranted of Mandela’s attacks on the BCM is the suggestion that the movement was somehow linked to the Central Intelligence Agency (CIA) – hence the fear that it could turn out to be another third force like UNITA. Here Mandela has nothing to go on other than the fact that the organization was flush with money from donors. These donors would not have been so supportive had the BCM been a threat to their way of thinking and their interests. On that basis he cites what became taken as a matter of fact in subsequent attacks on the movement by ANC members – which was that it was supported by the CIA. This is how Mandela makes the claim without appearing to be the one who is making it: “many political observers believe that American imperialism has chosen to support the BCM in order to stem developments towards socialism (p45).” The trouble with this line of argument is that it leads to the same generalization for which Mandela excoriates the movement. The BCM received funding from varied sources, and most of it from socialist oriented left-wing organizations in Europe, particularly in the Nordic countries. Most of the funding for the BCM came from well-meaning supporters of the liberation movement such as the Legal Aid Fund or World University Services. It is also true however that this dependence on foreign donors became the BCM’s Achilles heel – not for the reasons of ideological control Mandela is alluding to – but for security reasons. As it turns out many of these organizations were infiltrated by the apartheid government through individuals such as Craig Williamson. It is indeed a reflection of the significance of the Soweto uprising that all political movements claim responsibility for this rather tragic chapter of our history. Members of the Pan Africanist Congress point to the Bethal Trial in which their leaders were tried and jailed as evidence; members of the ANC claim they were directing things behind the scenes; and BCM leaders claim that the leaders belonged to their organization. Thus Mandela unsurprisingly argues that the uprising was coordinated by the ANC: “the ANC was able to work out a suitable formula to coordinate the efforts of the students with those of the organization. These efforts bore fruit, especially during the 1976 uprisings, when the bulk of the young people who were involved identified themselves with the ANC (p64).” And yet an ANC publication that came out a couple of months after the uprising criticised the youth for their adventurism and noted that the movement had been caught off guard by the uprisings (August 1976). But there is a reason why many of the young people involved would have associated or identified with the ANC – it was the widely recognized liberation movement, in the same way that if people were asked who their leader was they would have said Nelson Mandela instead of Steve Biko. The two processes – the dominance of the BCM on the ground and the recognition of the ANC and Mandela as the traditional liberation movement – were so intertwined that people did not make the distinction. It was only later with the emergence of political rivalries that this distinction became necessary. The leaders saw political mileage and sought to claim the event for their organizations when the actual reality of people’s experiences could not be compartmentalized into such organizational boxes. The person who captures this complexity best is Dan O’Meara: “Soweto regenerated a deep sense of pride in much of the black population. It was a key catalyst of the psychological liberation which the BCM had worked so hard to produce (O’Meara, 1996:181).” This is how Steve Biko described the context for the uprisings: “through our articulation of the aspirations of black people, many black people have come to appreciate the need to stand up and be counted against the system. There is far more political talk now, far more political debate and far more condemnation of the system from average black people than there has ever been since possibly 1960 and before. I’m referring here to the whole oppressive education system that the students are talking about … they were not prepared to be calmed down even at the point of a gun. And hence, what happened, happened. Some people were killed. These riots continued and continued. Because at no stage were the young students - nor for that matter their parents - prepared to be scared (Mandela, 2004:165).” Without the psychological revolution initiated by the BCM the students would never have rebelled and the ANC would never have infiltrated the uprisings because there would have been nothing to infiltrate. The only problem is that Mandela sees the uprisings as an outcome of the wisdom and foresight of the organization, when it was really more the ANC having to catch up and take advantage of a situation made possible by another movement. Contrary to the militant position of the BCM he adopts a similar practical attitude to the issue of homelands and other apartheid created institutions. At a time when the liberation movement would not brook any suggestion about collaborating with the homelands, Mandela wrote that “we will use dummy institutions once we are convinced that to do so will strengthen the struggle and hasten the enemy’s downfall (p54).” This strategy of using homelands as a bridgehead into the apartheid fortress backfired with the support the ANC gave to the Inkatha Freedom Party. But Mandela was proven right in the case of the Transkei, where Bantu Holomisa overthrew the apartheid stooge (and Mandela’s relative) Kaizer Matanzima to become that homeland’s military leader. Holomisa then used that space to provide bases for the ANC and the PAC. It is this ability to separate his personal position from the bigger picture that has made Mandela such an effective politician. It is this ability to make this separation that enables him to attract people of various ideological and religious orientations without putting his own as a badge on his sleeve. In that sense he avoids the inclination of many leaders to exclude those with whom they disagree. This is usually because they have personalized issues so much that they cannot distinguish between the issues and their own selves. Criticism of the issues is confused with an attack on the individual. Throughout the essay Mandela insists that the ANC should not leave other organizations out of the struggle, and that it should approach issues such as participating in elections “realistically and not idealistically (p55).” Thus he advocates a dual strategy in which the ANC should not abandon its armoury even as it explores the various bridgeheads into the apartheid system’s creations, including participating in elections. There is, however, a striking difference between how Nelson Mandela the partisan political activist writes about the BCM in the midst of struggle in 1978, and how Nelson Mandela the statesman writes about the movement as a statesman in 1994. He repeats much of what he had written in the 1978 essay – the idea that the young men of the movement would outgrow their youthful exuberance and join the mature Congress movement. However, he also notes that the movement helped him and his comrades avoid political fossilization: “we had been in prison for more than fifteen years; I had been in prison for nearly eighteen. The world that we left was gone. That danger was that our ideas had become frozen in time. 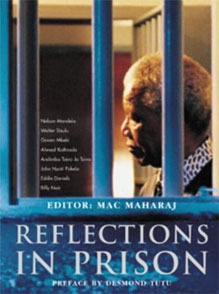 Prison is a still place in a turning world, and it is very easy to remain in the same place in jail while the world moves on … I did not want to appear to be a political fossil from an age long past (Mandela, 1994: 436-437).” On display in Mandela’s critique of the BCM in 1978 is this isolation from some of the political and intellectual currents around the world. His own adherence to non-racialism would come under severe stress in democratic South Africa’s own attempts at racial healing. In the hands of many whites non-racialism became the instrument behind which to hide and resist processes of transformation. Any mention of race was all of a sudden interpreted as going against the ideals of non-racialism practiced by Nelson Mandela. Mandela himself may have fallen for this – albeit for the purpose of nation building. His good intentions notwithstanding, his reluctance to challenge whites on issues of race gave whites a false sense of security. His biographer Anthony Sampson captured Mandela’s mixed legacy in this regard: “In his first months as President, he [Mandela] enjoyed a brilliant honeymoon, particularly with white South Africans, to whom this tolerant old man came as a wondrous relief … at the end of the first hundred days in office the Financial Times could find no whites who had a bad word for him. It was a normality which carried its own dangers, as black militants saw the revolution betrayed, and younger ANC leaders including Thabo Mbeki knew they must make reforms which would offend the whites (Sampson:1999:504).” Was it no wonder then that racial nationalism would return with the vengeance that it did under Thabo Mbeki and Tony Leon in the 1990’s? Perhaps if the ANC and Mandela had had a better appreciation of the role of Black Consciousness in speaking openly and frankly about race, white society would have been readied to openly confront this demon a long time ago. But then again, in politics, as in life in general, you win some, you lose some. Nelson Mandela brought us the priceless gift of freedom and democracy, and left us with the daunting task of learning to deal with a problem left unattended for so long – the problem of race. 1. I asked Barney Pityana to write this as part of my research on Steve Biko’s biography. Masilela, Ntongela. Interview with Sandile Ngidi, unpublished manuscript, 2000. Peller, Gary. “Race Consciousness,” in D. Danielsen and K.Engle (editors), After Identity, Routledge, 1995.